Looking for an easier way to create professional looking wire markers and cable markers? We offer label makers that can quickly create wire wraps, shrink tube labels and laminated labels. A wire marker printer helps organize cables and wires by colors and labels. Never again will you have to guess what wire goes where! Need help deciding what label printer would best fit your needs? Give us a call 800-748-6535. 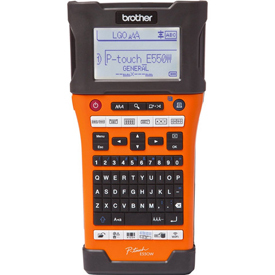 Brother PT-E550W - The PT-E550W industrial wireless handheld labeling tool kit comes with design software to help integrate into work flow processes. Design and print labels from a computer, or link to a database to save time and help reduce errors. Connect directly or send the label designs and databases wirelessly to the job site using a cloud server or by email. Using computer or mobile device, download the label designs and databases to the PT-E550W using Wi-F wireless connectivity, and then print virtually anywhere without a computer. Smart technology, QWERTY keyboard, automatic cutter and a large backlit display helps make the PT-E550W easy to use to print wider labels for marking cables/fiber/wire, faceplates, patch panels, punch blocks and more. Also prints on heat shrink tubing. Comes with software, case, Li-ion battery, adapter and 2-year limited exchange warranty. UL Recognized Labels All label components and print imaging for certain Brother industrial quality tapes have been tested by Underwriters Laboratories and the printed laminated label is a certified UL recognized component. Includes: PT-E550W Labeler, (1) 1/2" Blk/Wht Flex ID Tape, Rechargeable Li-ion Battery, Carrying Case, Ac Adapter, USB Cable, CD & Owners Manual.